Welcome, and thanks for taking an interest in Social Media Mining with R. Sentiment-laden social media is becoming increasingly pervasive. Meanwhile, techniques for harvesting and analyzing textual data are becoming more sophisticated and powerful. The opportunity presented by the intersection of these two trends caused us to put together this book, in hopes of allowing business analysts, marketers, pollsters, social scientists, and others take advantage of this fortuitous combination of events. We assume that readers come to the book from a wide array of backgrounds. As such, we make no assumptions about a reader’s coding proficiency, social science background, knowledge of sentiment analysis, or statistical wherewithal. The book introduces readers to R, a preferred statistical computing software, and shows readers how to scrape social media from Twitter from within R. We also provide a rigorous, yet concise, social science background for making inferences about sentiments. Finally, the book walks readers through the theory and practice of several sentiment analysis techniques, including a novel, unsupervised approach. For more details, feel free to peruse the chapter summaries page. 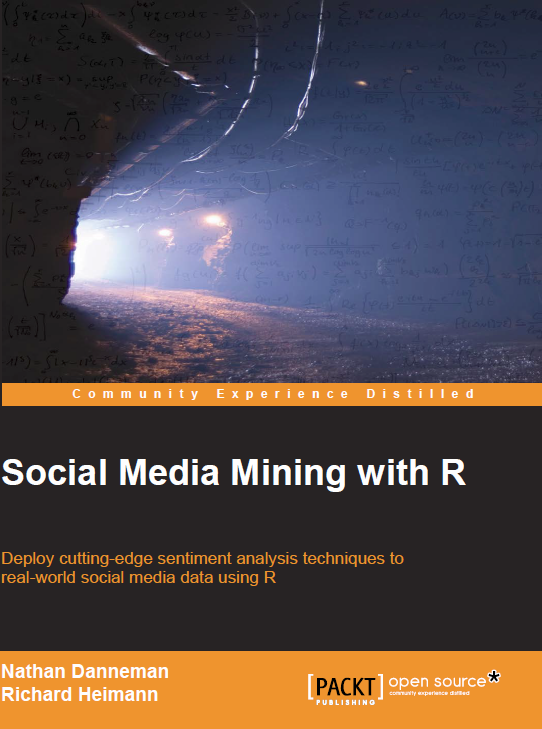 Related materials, including materials for our January 24th District Data Labs Workshop, titled “Analyzing Social Media Data with R” will be shared to spur on like-minded researchers and educators with respect to mining social media data. Please refer to our Updates Page for more information.